Nuts are becoming increasingly popular as a crunchy and nutritious snack. Pecans are one of the most popular edible nuts native to North America and Mexico. The pecan tree is a large deciduous tree belonging to the hickory family. A typical pecan has a buttery rich shell which is golden brown outside and beige inside. The kernel occupies 40% to 60% of the space inside the shell. This kernel has a grooved surface but is slightly more oval in shape. The pecan has a sweet, rich and buttery flavor and texture which can be attributed to its high levels of monounsaturated oils. 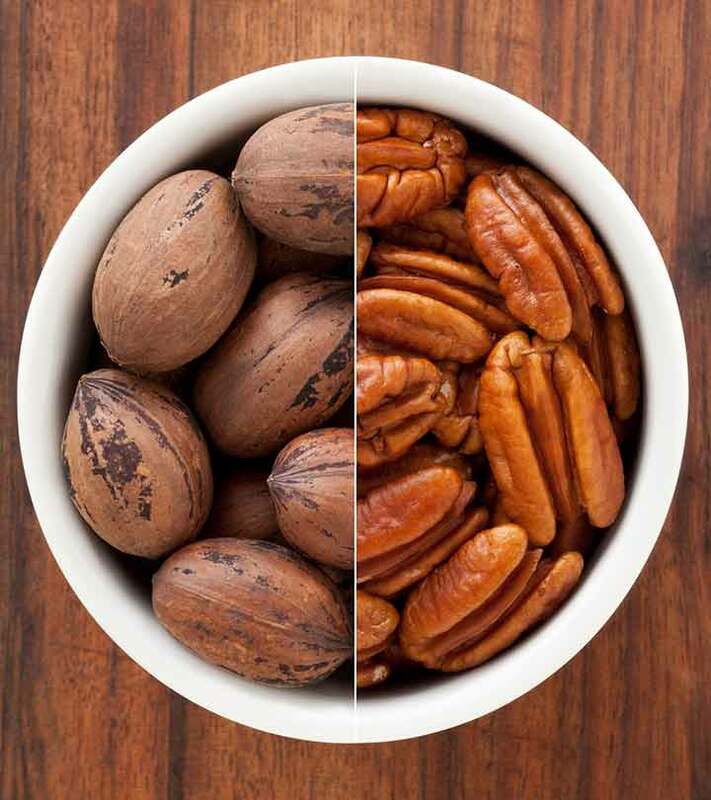 Pecans have a fat content of over 70% which is the highest among all the nuts. Shelled pecans are available all year round while unshelled pecans are available in autumn. Pecans come in various sizes such as mammoth, extra-large, large, medium, small and midget. They are also available in several forms such as whole pecans, pecan halves, pieces, granules and meals. Their rich buttery flavor makes them suitable for both savory and sweet dishes. The famous “pecan pie” is a classic South American dish which uses pecan as a primary ingredient. Raw pecans can be salted or sweetened and make for a delicious snack. They can be sprinkled over desserts, particularly sundaes and ice creams. They are also widely used in confectionery as an addition to biscuits, sweets and cakes. Pecan nut butter is a popular spread for breads, toast etc. Pecans are rich in fiber which boosts the health of your heart by reducing the risk of coronary heart disease and preventing some forms of cancer. It also contains monounsaturated fats like oleic acid along with phenolic antioxidants that are healthy for your heart and help prevent coronary artery disease and strokes. As per research, pecans may help prevent coronary heart disease by inhibiting unwanted oxidation of blood lipids. The fiber contained in pecans promotes colon health and facilitates regular bowel movements. It enables the colon to work at greater levels of efficiency by cleaning out the gastrointestinal system. Besides, it prevents constipation and reduces the risk of colitis, colon cancer and hemorrhoids. Pecans contain oleic acid, a fatty acid which has been found to reduce the risk of breast cancer. It has been shown to promote an increase in breast cancer cell invasiveness by promoting migration and proliferation in breast cancer cells. The outside appearance of our skin depends upon how we treat it from the inside. Thus, adequate nutrition is inevitable for maintaining a healthy skin and preventing skin problems. The toxins inside your body can make your skin suffer by causing breakouts, dullness and excess oil. Pecans are a good source of fiber which can do wonders for your health and hence, for your skin. It aids in the elimination of toxins and waste from the body, thereby improving the appearance of your skin. Pecans contain zinc which helps in maintaining skin health by guarding against infections. Vitamin A on the other hand is an antioxidant which gives you a clear complexion. 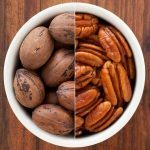 Pecans contain numerous antioxidants including ellagic acid, vitamin A and vitamin E. These antioxidants fight and eliminate the free radicals which are responsible for causing premature skin ageing. Thus, pecans can prevent the occurrence of signs of ageing such as fine lines, wrinkles and pigmentation. Just like our skin, healthy hair is also a reflection of a healthy body. 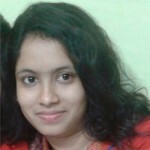 Thus, our hair follicles require adequate supply of vital nutrients to maintain their health and prevent hair problems. The nutritional value of pecans makes them beneficial for your hair. Pecans are an excellent source of L-arginine, an amino acid which, when applied topically helps treat male pattern baldness as well as encourage the growth of healthy hair. Vibrant blood flow throughout the body and to the hair roots is vital for healthy hair growth and scalp. L-arginine is beneficial in this regard as it improves the health of the artery walls by making them more flexible and less prone to blood clots which can block the flow of blood. Pecans (Carya illinoinensis) Nutritional value per 100 g.
Calories and Fat: Pecans are a rich source of energy with a 100 gram serving providing 690 calories. They are a good source of unsaturated fats, comprising of about 60% monounsaturated fats and 30% polyunsaturated fats. An ounce serving of raw pecans provides 20 grams of fat out of which 11 grams is monounsaturated fat, 1.7 grams is saturated fat and the remaining is polyunsaturated fat. The same serving size of pecans provides 1 grams of alpha-linolenic acid (ALA). Carbohydrate: An ounce serving of pecans provides 3.9 grams of carbohydrate. The same serving comprises of 2.7 grams dietary fibre and 1.1 grams of sugar. An ounce serving of pecans provides about 10% of the recommended daily allowance of fiber. Vitamins: Pecans are an excellent source of vitamin E, particularly gamma-tocopherol with a 100 serving providing 25 grams of this vitamin. They also contain various B-vitamins especially thiamin which is also known as vitamin B-1. An ounce serving of pecans provides 0.18 grams of thiamin which is equivalent to 15% and 16% of the recommended daily intake for men and women respectively. Minerals: As stated earlier, pecans contain a wide variety of minerals. They are an excellent source of manganese and copper. An ounce serving of pecans provides 52% and 66% of the recommended daily intake of manganese for men and women respectively. Protein: Pecans are high in protein with an ounce serving providing 2.6 grams of this nutrient. This amount fulfils 5.6% of the daily protein requirement for adult females and 4.6% for adult males. Flavonoids: Flavonoids are basically a large group of plant based substances. These function as antioxidants by fighting inflammation that leads to cardiovascular disease and other chronic illness. A 3.5 ounce serving of pecans provides 34 milligrams of flavonoids which is quite high in comparison to other nuts.